From left, Terry Hester, Tyler Trent and Brandon Greene sit in Highland County Common Pleas Court Wednesday afternoon. A laundry list of cases are pending between four Greenfield co-defendants charged with drug- and burglary-related crimes, and some are set to testify against each other in upcoming jury trials. Tyler Trent, 30, Greenfield, on Wednesday pled guilty in three of his five criminal cases and now faces up to five years in prison. Trent pled guilty to two separate counts of aggravated possession of methamphetamine and one count of receiving stolen property. The most notable case against Trent lists Terry Hester, 34, Taylor Jenkins, 23, and Brandon Greene, 32, all of Greenfield, as co-defendants. In that case, the defendants are accused of breaking into Dave Fairley’s barn dwelling in Highland County and taking items worth more than $1,000. Trent, Hester and Jenkins are charged in that case with two counts of burglary, one count of breaking and entering, one count of theft and one count of grand theft. Greene is charged in that case with receiving stolen property. Meanwhile, three separate cases are also pending against Hester, and attorneys are negotiating possible plea deals. In addition to the Fairley case, Hester is charged in separate cases with attempted burglary, tampering with evidence, receiving stolen property and possession of drugs. Jenkins pled guilty on Wednesday to burglary and theft in the Fairley case, and will testify against her co-defendants if they go to trial. She faces more than two years in prison. Greene rejected a plea offer for his receiving stolen property charge and his trial was continued until after his co-defendants’ cases are resolved so they can testify on his behalf. 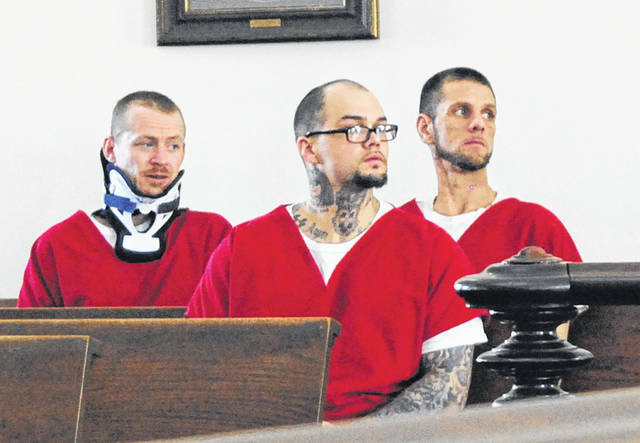 https://www.recordherald.com/wp-content/uploads/sites/27/2019/03/web1_f-gf-boys.jpgFrom left, Terry Hester, Tyler Trent and Brandon Greene sit in Highland County Common Pleas Court Wednesday afternoon.